First, I have a quick announcement and an opportunity to do something really kind. Some of you may have heard the story about the Pleasant Run Elementary robotics team called the PantherBots. They were competing at their district’s high school among a bunch of other schools and got first place. And during the competition and after the challenge as they were leaving and in the parking lot, this group of 9 and 10 year olds and their families, were told “Go back to Mexico” and subjected to other racist comments. Two of the kids are African-American and three are Latino. And then Shannon lists their address which again, I will link to for you. I saw that and I knew that you all would want to help! Maybe you have a book on your desk or bookshelf right now that you could spare. Hey – send it media mail – it’s cheap! For a couple of bucks you can let this community know that they are supported, we have their back, and do something tangible to bend that arc toward justice. So, I’m going to get on that this week and mail out some awesome books, and I hope you will, too! Today I’ll be giving a brief overview and review of the new live-action version of the familiar fairy tale, listing a few other versions middle grade readers might want to check out, and discussing some ways you could do some analysis and comparing with your kids and students. Have you ever been to a Movie Tavern? They recently opened one up near us and it is decadently wonderful. You can have a full meal, maybe a cocktail (I personally like the milkshakes), and enjoy a movie while you relax in a recliner. It is everything that is wrong (and right) with America! Anyway – my mother treated myself and my sister-in-law and my kids to a girls’ brunch and Beauty and the Beast viewing last weekend, and I thought I’d let you all know how it is. I’m making the assumption that you’re familiar with the story so expect a couple plot spoilers. First off, I do want to acknowledge that the Beauty & the Beast story is – shall we say “problematic”? I enjoyed the Disney version when it came out when I was a teenager, but later as an adult the sexist and kind of abusive aspects of it always rubbed me the wrong way. So, I was looking forward to seeing how this new movie featuring Emma Watson as Belle and Dan Stevens as the Beast chose to depict the story. I loved the opening which shows the prince (played by Dan Stevens) getting ready for a ball and dressing in full Louis XVI-style regalia with powdered wig, full make-up, and a little black mole. It reminded me a bit of the series Versaille on Netflix. So far so good! I’m also noticing now that the cast seems a little more diverse than the original. Madame de Garderobe is played by Audra McDonald and Plumette is played by Gugu Mbatha-Raw – both women of color. The background characters are a bit more diverse so that seems to be going in the right direction but I would have like to have still seen more. And – Gaston. His handsome hyper-masculine character is utterly obnoxious and he treats Belle like the ultimate prey. He is just vile! But – Luke Evans does a fantastic job with him. His backstory is more filled out., which is interesting. He was a soldier, and there’s hints of PTSD there with this darker interpretation. And the “Gaston” tavern number is so much better than the original – full of people and the characters are vibrant and it’s funny. I think probably the best song sequence of the movie. During this scene, I also like the new envisioning of the LeFou character (played by Josh Gad, the voice of Olaf). There’s more depth to that role and of everyone, he maybe changes the most throughout the movie. Now, he’s the character that the director has said is involved in a “gay moment” in the movie. And – I guess you could interpret LeFou’s actions toward Gaston in that way, and there’s a scene at the end where he dances briefly with another man. But I think the controversy, if you can even call it that, is really overblown. I’m glad Disney didn’t edit anything out for release in other countries, but on on the other hand, I don’t want to give them too much credit either. The situation is treated like a joke and maybe just another in a long line of gay characters depicted as fools. But generally, I really liked that performance and want to see more of Josh Gad. Back to the plot! Belle’s father (played by Kevin Kline) is attacked by wolves – this might be the scariest moment of the film and he takes refuge in the castle, takes a rose from the garden, and the Beast freaks out and imprisons him. The horse leads Belle back where she tricks her father, takes his place, and the story carries on from there. In the castle – Chip is simply adorable and if I were Plumette, I would totally go for Ewan McGregor as Lumiere, too. I was skeptical of how live people would interact with dancing teapots and clocks and such, but it was done well and not as creepy as I worried it would be. And the “Be Our Guest” routine was lovely. The relationship between the Beast and Belle has always seemed a weird portrayal as romance, but I had a couple thoughts as I watched this version. First, it reminded me a lot of Pride & Prejudice where it takes Elizabeth Bennet going to Mr. Darcy’s home and seeing how his staff universally loves him and sacrifices for him, that starts to shift her viewpoint. And you see this in the Beauty & the Beast film when Mrs. Potts describes his childhood to Belle and explains how he’s better than his horrendous first impression. Second, never underestimate the allure of a magnificent library and the power of reading aloud to connect people. Belle reads to him and reconnects him with books and that was a point where she started to see his humanity. Expanding on Belle’s backstory and explaining what happened to her mother and the symbolism of the rose was another really great part of this movie. It’s a short scene, and I don’t want to spoil it for you but explains why her father is tormented by the memory of her mother. A quick word about the famous yellow dress. Here it is thankfully toned down and simplified – no mass of ruffles. I was more enthralled with the jewelry, to be honest with you – especially her climbing earrings. I’ve been seeing more and more of those – you know, the ones that go up the ear. I love those, but I don’t think I could pull them off to be honest with you. And I’ll end my thought with a couple serious notes. First, ugh, Gaston’s firing up the villagers who’ve known Belle all their life really brought home how easy it is to get people roused by claiming there’s something dangerous. Okay – so, I am known as a bit of a crier at movies. And I held it together for most of the film. Until the end when Mrs. Pott’s is frantically searching for Chip as all the enchanted servants are turning completely into just objects. And she, essentially dies with her last thoughts a desperate worry for her son. But then, as you know – they are released from the curse. And Emma Thompson, who plays Mrs. Potts, wraps her arms around her son and says, “You smell so good!” and wow – you just realize how these people have suffered – not being fully human. So that was my tissue moment. In short – I thought this was a great movie – I liked it way better than the Disney version. And I think I’ve even forgiven Dan Stevens for leaving Downton Abbey. If your school follows the Common Core Standards, one of our major goals is to help students learn how to compare different versions of a story and analyze multimedia representations of that story. Even if your district hasn’t adopted those standards, it is still a worthy goal and one of the more fun ones to teach. And fairy tales like Beauty & the Beast are perfect texts to explore. They’ve often changed (a lot!) over the years, and each generation and place has it’s own interpretation. What’s more interesting than simply having your students or children point out the differences, is asking them to think about WHY the author decided to change it. A quick word of caution though – those original fairy tales were DARK and much more violent! So definitely preview anything and use your own judgement about what’s appropriate. It’s probably best to start with just comparing one scene a couple different versions and then you can select something that’s okay for your age group. Alright -there’s obviously some great fodder for discussion and analysis. Also – while you wait for this new version to be released outside of the theatre – use the soundtrack and a print out of the lyrics! In the meantime, here are a few more versions that are worth checking out. Beauty and The Beast: A Pop-up Book of the Classic Fairy Tale by Robert Sabuda This is a gorgeous book illustrated in the style of stained glass. Then there’s the new 2017 picture book called Beauty and the Beast by Cynthia Rylant and illustrated by Meg Park. This one has a stronger focus on Belle’s courage and the illustrations in blues and purples are beautiful. Then there’s the version by by Max Eilenberg and Angela Barrett who’s the illustrator with lush watercolors and a curiously creepy depiction of the Beast. If you’ want to see something more gilded and ornate, then the version illustrated by Kinuko Craft is worth exploring with your kids. There’s also a Beauty & the Beast version set in West Africa by H. Chuiku Lee. I noticed in our recent Scholastic form some backstory books by Disney featuring the villains and the one called The Beast Within tell the story of how he came to become so bitter and monstrous. Disney has also released As Old as Time: A Twisted Tale by Liz Braswell that is a different take on Belle and includes more of her mother. In this part of the show, I chat about books centered around a theme and discuss three things to love about each book. 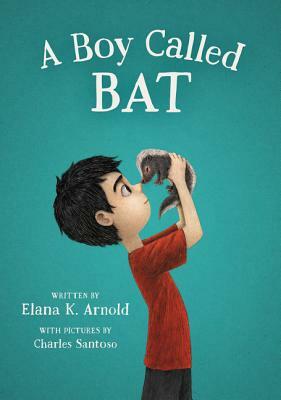 This week the two books on my mind the most are two new contemporary fiction releases: A Boy Called Bat by Elana K. Arnold and Forget Me Not by Ellie Terry. How this book understands the challenges of kids with divorced parents. For Bat and his sister, that means every other Friday they go to their dad’s to spend the weekend. His dad calls him “sport”, which he hates, and makes a weird, smelly chili in the crockpot and Bat has to watch baseball on tv. And the change in routine makes Bat feel uncomfortable. And as a kid of divorced parents, I could really relate to some of those scenes. And I am sure that kids you know could also connect to those sections. Bat’s relationship with his older sister. Like a lot of siblings they are a mix of friendly and frustrated. Janie is, I think, in middle school and watches Bat a couple days after school when their mom has to work late. And Bat is particular about his snacks and wants to tell the same stories over and over again and sometimes it’s hard for Janie to be patient. Especially when Bat does something to one of her t-shirts. But then…. there are sweet moments, too. One especially stands out when they are both at their dad’s apartment, stuck watching baseball, and Bat braids Janie’s hair for her. And it’s a small but a sweet moment between siblings that are very different. Bat – he is earnest and kind of quirky. His social interactions are sort of awkward. For example, he’s sometimes too honest and doesn’t quite get most figurative language. He’s definitely a literal thinker. He sometimes flaps his hands when he gets upset, and loud noises tend to bother him. And as those behaviors started to build up throughout the book, I started to wonder – what’s the deal with this kid? Does he have Asperger’s or autism? I kept waiting for the author to clarify that, but the more I think on it, the more I’m glad that Elana Arnold did not pin a diagnosis on this boy. And simply let us come to know and love him as an individual. And yet – I’m glad to have another book in our library like Rain Reign or A Whole New Ballgame or Counting by 7s with a character that might be on the autism spectrum that kids can get to know. And it’s at a lower reading level than those other books – probably best for about ages 7-11. But would make a great read aloud for Kindergarten or 1st grade. A Boy Called Bat is a heartfelt book with characters you love, and I hope that we haven’t seen the end of Bixby Alexander Tam. How this book is like a duet between the voices of Calli and Jinsong. The chapters alternate between their points of view with Calli’s section in verse and Jinsong’s parts in prose – each with their own font. I really liked how that helped you differentiate between the two characters. I appreciated how this was an honest take on bullying in schools. The children who are harassing Calliope are being cruel, but often have their own story that if you got to know them, you might have some empathy. I know that there is absolutely never any excuse for harassment but sometimes those kids that can be the nastiest are going through some tough stuff. Also – considering the bystander angle, this book really shows how hard it is to stand up to people when they’re being mean – even if you’ve signed one of those pledges like Jinsong has as part of his role as student body president. His choices and regrets I think are a more honest portrayal of how those situations really tend to go down. The gorgeous cover. And I know it’s a seemingly small thing, but when a cover is done right – it draws you into the book and after you read it, the images reveal something deeper than you first noticed. This was one of those books that as soon as I saw the cover, I was entranced by it. So this cover is a deep shaded midnight blue with bright reddish poppies circling the title along with blue forget-me-nots and orange paper lanterns, moon, stars, telescope, rock – all the little mementos from Calli’s story. The more I look at it, the more I just love the sense of a bright garden in the moonlight. 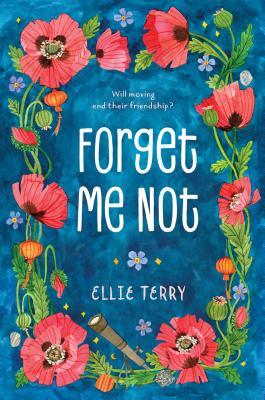 Ellie Terry’s Forget Me Not is warm and good-hearted and offers a unique point of view for kids, and I love that this novel can shape their opinion about those with Tourette syndrome and hopefully widen their perspective beyond the unfortunate stereotypes. Terry herself has TS, and I’d love to read you just a bit from the Author’s Note in the back. Alright – that’s it for our show this week. Don’t forget to show the students and robotics team at Pleasant Run Elementary some love! If you have topic you think we should cover, I would really love to hear from you. You can email me at booksbetween@gmail.com or message me on Twitter/Instagram at the handle @Books_Between. Thanks again for joining me this week. You can get find a transcript of this show and all of our previous episodes at AlltheWonders.com. And, if you’re enjoying the show and finding some value in what you hear, please help others find us too by telling a friend, sharing on social media, or leaving a rating on iTunes or Stitcher. It’s a much longer chapter books, but Beauty by Robin McKinley is my all-time favorite fairy tale retelling, and I will forever be convinced that while I’ve never found an acknowledgement, Disney writers must have read this book when writing their animated movie. All the best things about their character, Belle, seem to come directly from this beautiful novel by McKinley. In fact, if you’re working with middle school students, you could read both Beauty and Rose Daughter and be in Beauty in the Beast heaven! Hi, Corrina. Great episode! I haven’t seen the movie yet. The enchanted objects may go back to Jean Cocteau’s surrealist Beauty and the Beast film from the 1940s.